:Family life and values are under threat more than ever before, yet the family is the one stabilising unit for all of society. So many individual, community and national problems can be traced back to the sad disintegration of family life. Of course it was God who designed the family unit for the well-being of mankind, young and old. In this series of booklets, we are taken back to the Bible to see again that God's principles are the only secure foundations for our lives. 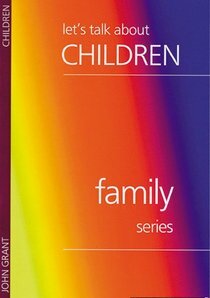 About "Let's Talk About Children (Family Series)"